Never before here at Travellous World have we explored South America. Today, Anna from Postcards from the World will change that for good. As our Local Expert on Atacama, she highlights all that the Chileans love to do and see, and that they want foreigners to experience too. Driving through the lands of dry earth, with the ocean on one side and the magnificent Andes on the other, admiring the pastel colours of the landscape is more than you could expect from the driest place on earth. Crowds of tourists head towards San Pedro de Atacama, a charming little village where visitors rest and party. This is not the place though, that locals find most attractive to spend their free time. Atacama surprises and Chileans know it well and I, now, know it too. This phenomenon does not happen every year, but when it happens is incredible and crowds of Chileans go to Llanos de Challe to enjoy the view of mountains covered with a colourful carpet made of flowers. 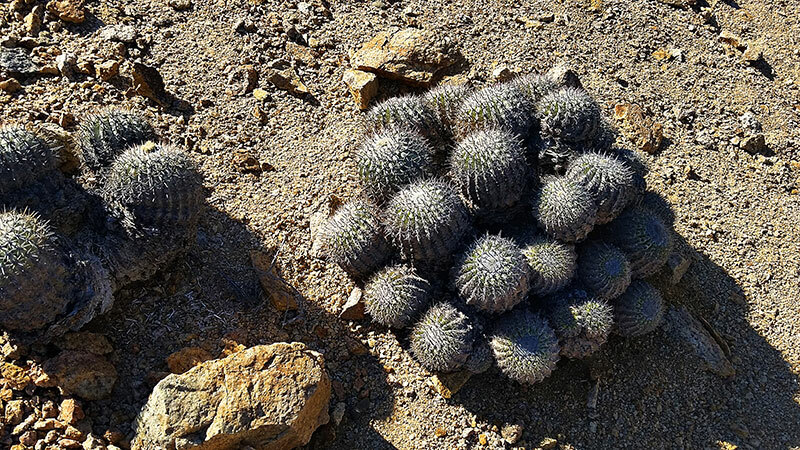 Witnessing a desert turning into a fragrant field of rainbow shades will stick to your memory for long. The best time to see it is in spring, between end of August and October, so if possible plan your trip then. This little town is considered as a very popular and touristic place. Not many foreigners however, reach there. It got its fame for turquoise waters and white sand beaches. While there, it is worth taking a short trip to the beach La Virgen as well and you will be a part of Chile style holiday resort. Another popular place in Atacama to spend holidays and weekends is one of many national parks in Chile- Pan de Azúcar This place is perfect for those who likes spending time outdoors as the trekking paths there are limitless. This place offers another treat, which I find quite remarkable. A boat trip to a small island inhibited by Humboldt penguins. The best time to go there is between September and April, when the mating season for those fascinating creatures happens. Have a hot dog! It is not the kind of hot dog you have in mind, I can assure you. It comes with different toppings and is being served on a little plastic pedestal. Finishing it without staining your clothes is going to be a challenge, which I’m telling you in a secret, I haven’t been able to win to this date. 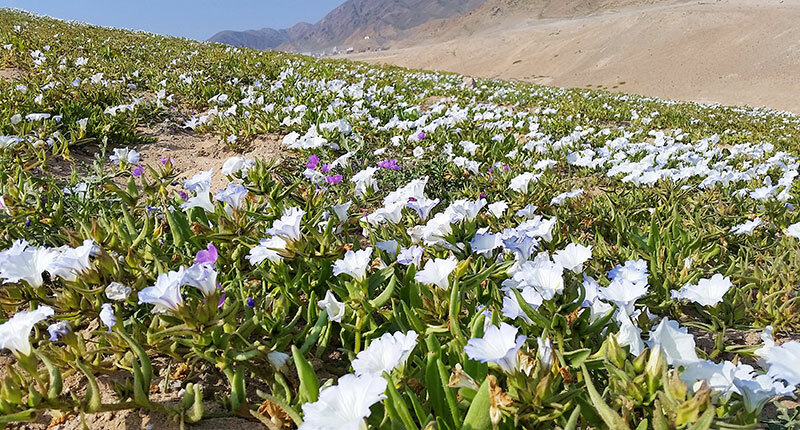 Antofagasta is the main connecting point between the north and the south of Chile and a place where some travelers rest before heading to San Pedro de Atacama, but very few explore. 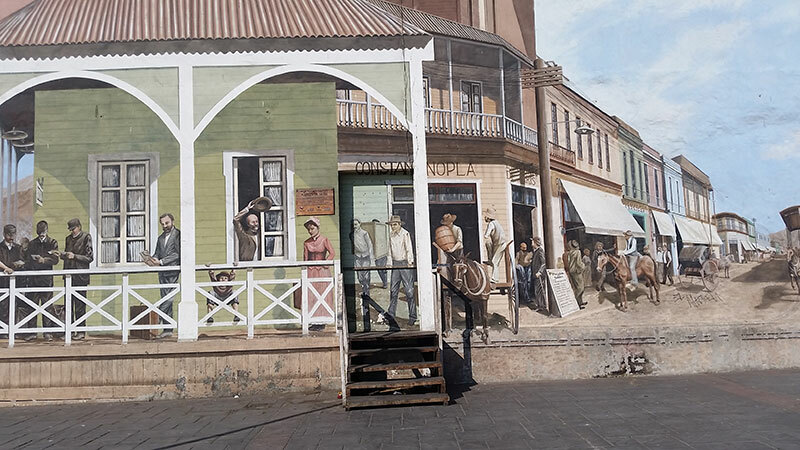 Antofagasta is a fairly new city, but with 150 years since the establishment the history is rather interesting, although the city itself is not being not considered very pretty. Chileans, so proud of the city and the history of the region, pay a particular attention to remind everyone of it by mural graffiti, rich museum and open air history walks. 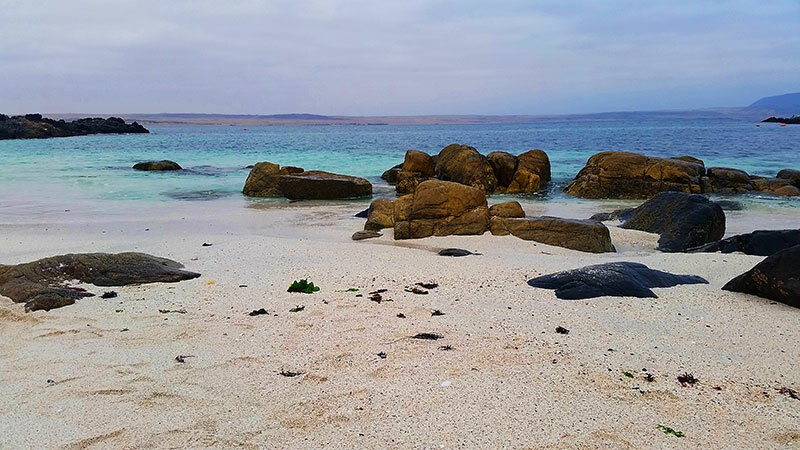 Chileans love camping and if you are visiting this part of Chile, you can do it too. To camp Chilean style is not an easy task, I must warn you. Here, it is taken to a completely new level and results in building small villages at the beach with all equipment you would normally use in the house. If you see small camps at the beach surrounded by net fences, a barbeque and children playing, this will be exactly what family vacation looks like. Spend a relaxing evening with friends in Roca Roja (Red Rock) just outside of Antofagasta with breathtaking views of the ocean. 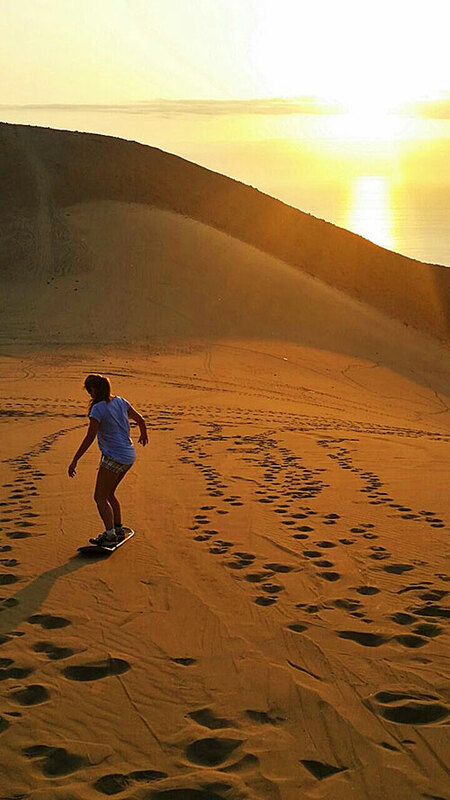 If you are the more active kind, boarding down the dunes is something for you. Groups of friends and whole families escape there from the business of the city, usually in the evening when the hat does not burn and the falling sun decorates the dunes. Asado is a barbeque Chile style. Friends and families meet together, usually during weekend when they prepare delicious barbequed food. They also love inviting foreigners to join them. Markets in Chile are an essence of food shopping routine. 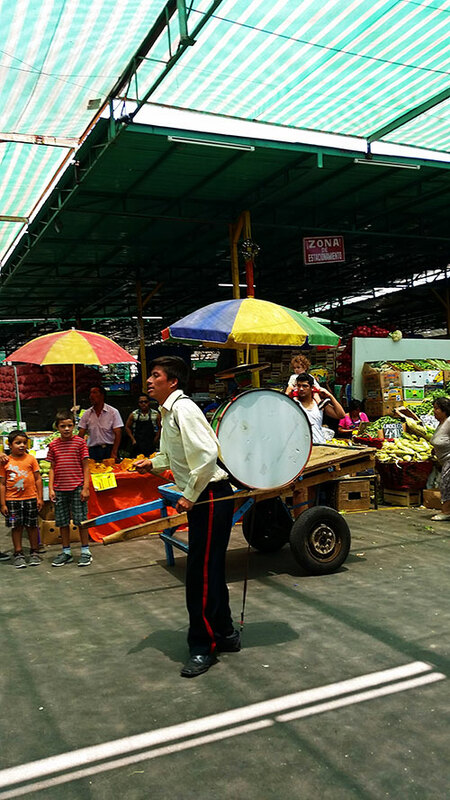 Walking through boxes and stands filled with fresh fruits and vegetables, singing sellers, dancing groups and ‘one-man orchestra’, the famous chinchinero will make your experience very interesting. 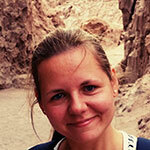 Chile, and more specifically Atacama is the destination Anna takes us to in a new Do as the Locals Do. With sand boarding, beach camping and a flower desert. Who likes to hop on a plane to Chile already? I know I do!